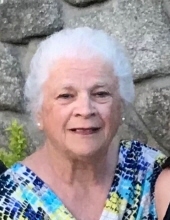 It is with great sadness that the family of Margaret "Marge" (Saillant) Guillet, 77, share the news of her passing on September 24, 2018 after a brief illness. Marge is the wife of Louis Guillet Jr. of Nasonville. She was born in Woonsocket, to the late Theodore and Theresa Saillant. Marge and Lou grew up together in Chipman's Corner and began dating when he was at Mount Saint Charles and she at St. Claire's. Their 57 year marriage was filled with the love and joy of family and friends. Marge was always at her happiest when surrounded by those she loved. Marge and Lou could still be seen holding hands as they enjoyed autumn fairs, British car club outings and attending every manner of activity for their six grandchildren. Marge earned her Associates Degree from Johnson and Wales and completed her Bachelor of Human Studies from URI in 2002, all the while raising her family and working full time. Marge has been a lifelong advocate, particularly for her son, David, and her husband. After a career in insurance, she pursued her passion by working with children and adults with disabilities helping them to become active citizens in the community. She single-handedly started a program in Rhode Island called "Home of My Own" where adults with disabilities were able to own their own homes. A memorial mass will be held on Monday, October 8, 2018 at 10:30 AM in St. Theresa's Church, 35 Dion Dr., Nasonville. Arrangements are under the direction of the Boucher Funeral Home, 272 Sayles Ave. Pascoag. In lieu of flowers, memorial contributions may be made in Marge's honor to Meeting Street School, 1000 Eddy St., Providence, RI 02905. or at www.meetingstreet.org or to St. Theresa's Shrine, 35 Dion Dr., Harrisville, RI 02830. To send flowers or a remembrance gift to the family of Margaret L. Guillet, please visit our Tribute Store. "Email Address" would like to share the life celebration of Margaret L. Guillet. Click on the "link" to go to share a favorite memory or leave a condolence message for the family.